We have all been stuck in the car for long road trips at one point or another. Traffic jams, traveling for fun, or traveling for business. No matter the reason, being stuck in the car for any extended period of times is no fun! Ever! Add kids into the mix and it can get even worse. A long road trip with a screaming baby is my own personal hell here on earth. You know you have been there! Then I was introduced to Playaway and Playaway View and I was thrilled when they offered to send me one to try and out tell you all about it. For this review I got to try out let my kids try out the Playaway View. 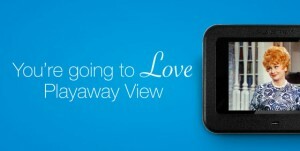 What is the Playaway and the Playaway View? I’m glad you asked! Playaway and Playaway View are the first-ever, self-playing, pre-loaded digital media players. Now you can stay entertained in the car without draining the battery on your cell phone and computer. They are individual, light-weight, hand-held rechargeable devices with a diverse range of titles. The Playaway features something for everyone, and you can listen by yourself or as a group in the car with nothing more than an audio cable. Playaway comes preloaded with hit audio books so you can listen as you drive. The Playaway View works in much the same way but rather than audio books it comes preloaded with videos. With both devices there are titles that will appeal to any age group. How Can I Choose My Titles? The Playaway and Playaway View are a little different in that they are not sold for retail. Instead they are offered in schools and at libraries across the country. Both come preloaded with different audio books or videos and can be kept for up to three weeks just by checking them out from your local library. As I mentioned, we checked out the Playaway View and we had a long day in the car that was the perfect opportunity to try it out. 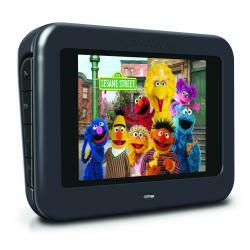 Ours came preloaded with videos from Sid The Science Kid. Miss Stalin loved everything about it. The size and weight made this a perfect device for Miss Stalin to comfortably hold while in the car. 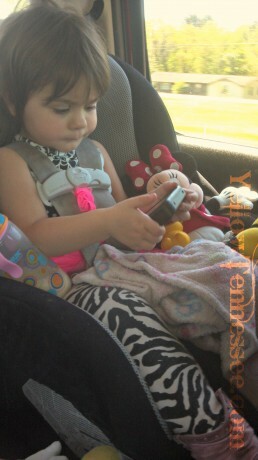 Since she is only 2 we didn’t use headphones and she had no problems with being able to hear the video. The buttons are all located on the side of the device keeping them out of the way of small hands being able to bump them. However the buttons themselves are easy to control and I have zero problems figuring out what button did what. As you can see, she loved it! The only problem we had with the Playaway View is that we didn’t have 2 of them. There were a couple of little fights over who got to watch it next. Now through May schools can enter to win their own $1,000 Playaway starter collection. School librarians and teachers can enter the contest at http://school.playaway.com/ to qualify. One lucky school will be awarded a starter collection in the months of March, April and May. In the meantime be sure to check out your local library and see if they have the Playaway or Playaway View.